March and April are perfect months to get outside in Arlington. The days are finally beginning to warm up enough so that you don’t have to carry around layers and layers. So if you have avoiding the chillier weather but want to get outside before it gets too hot, now is the time! 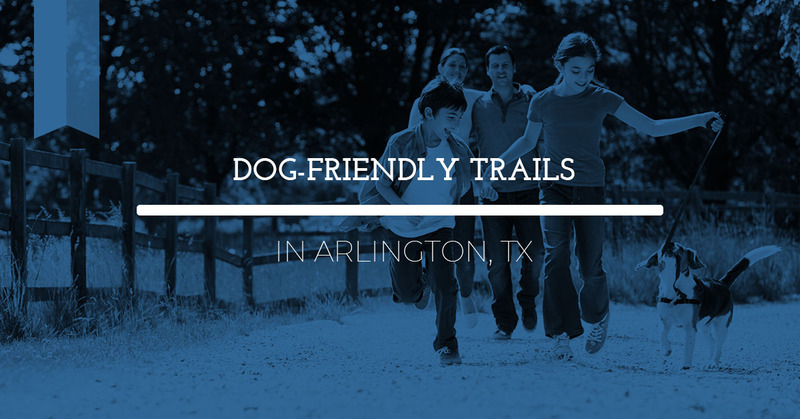 So whether you’re wanting to hit the trails by yourself, or with the doggo, here are some of the best pet-friendly trails in Arlington and Dallas, TX. At Allcare Foot & Ankle Care, we understand the importance of exercise and getting in a good workout — for your whole body as well as your feet! So put on a pair of your favorite, most supportive sneakers and hit these trails! If you ever have issues with your feet, whether it’s an ankle sprain, diabetic foot issues, or corn removal, our team of podiatrists provide exceptional care for your feet and ankles. The south entrance to the park is at 701 NW Green Oaks Blvd and is a system of parks along the Trinity River. There are over 1,000 acres of forest with a 75-mile park from west Fort Worth through east Dallas. Throughout the park, you can look forward to spotting a variety of wildlife (400 species!) including birds and other animals, trees, and flowers. Along the trail are several lookouts and concrete trail turnarounds, drinking fountains, several access points, and even an area for mountain biking. Just be sure to bring plenty of water for longer hikes. Located off of NE Green Oaks Blvd., just west of highway 360, this 7-acre park features concrete walking trails, benches, picnic areas, and a playground, making this area a relaxing getaway. Take a short walk and then find a quiet place to rest and read a book or keep wandering to explore the local wildflowers and birds. Perfect for a long walk with the dog or a bike ride, this 11.9-mile trail is an out and back trail located in between Grand Prairie and Arlington. One end of the trail is located at Matlock Rd and Cravens Park Dr. and the other end is located off of Bentley Ct., off of S Great SW Parkway. Much of the trail is along the South Fork Fish Creek where you can view flowers, birds, and trees. Both of these trails are located on the southeast end of Joe Pool Lake, and other two different lengths. The Cedar Hill Trail is a 10.2 mile loop that weaves and curves throughout the Cedar Hill State park. The Dorba Trail is a shorter, 5-mile loop trail in the same area. Both are dirt trails, making them slightly more difficult, but you can still get beautiful views of the lake and wildlife. With the Cedar Break Trail, you can explore the south side of the preserve and is a 2.2 mile hike, but doesn’t have views of the lake. Catpond, Fossil Valley, Red Oak and Escarpment Trail Loop is a 2.5 mile trail with beautiful views of the lake and is accessible to all skill levels. Bluebonnet Trail is a .9 mile hike that heads north through the preserve. This is also an easy trail, but with no views of the lake. Wear the Right Shoes: Your heel should sit snugly at the rear of the shoe, but should also give your toes some wiggle room. If there is any space, the foot will slide around and can lead to blisters. In addition, it’s a good idea to break in new shoes before you head out on a longer trail. Trim Your Toenails: Take a look at your toenails before putting on your shoes. If the nails are too long, give them a quick clip. Podiatrists recommend that you cut straight across the nail rather than a curved cut. This will reduce the risk of developing ingrown toenails. The Socks: Your feet get support from the shoes as well as the socks. They best materials are either wool, acrylic, or nylon. Cotton may seem like a good choice, but they tend to trap moisture, which will keep your feet from breathing, which is especially important in the Arlington humidity. Socks should fit snugly around your foot and toes and should be slightly taller than the shoe. The above hikes are fairly simple, so a regular pair of sneakers and socks should do just fine, but if you do experience any problems with your feet or ankles, you can visit the podiatrist at Allcare Foot & Ankle Care. Our team is dedicated to providing exceptional care for everyone in Arlington and Dallas. Get to know Dr. Tran and if you have any questions, feel free to reach out to us!